Created for high-precision soldering jobs, and in response to customer demands, the new JBC NANT Nano Soldering Stations are targeted at applications that require more than one nano soldering iron at the same time. The three new NANT stations use the same control unit as JBC Tool's popular NAST-1A NANO Digital Soldering Station. If you're working with small components such as 0402, 0201, and 01005 chips (or chips that must be viewed under a microscope) the NANT stations' two NT105 Nano Soldering Irons can be used simultaneously for high-precision nano soldering work. The extremely lightweight and comfortable NT105 irons offer maximum control through their short tip-to-grip distance and, used with the C105 cartridges, provide up to 15 watts of power. The JBC NANT stations utilize JBC's exclusive heating system with intelligent sleep and hibernation features. The control unit's built-in display offers a menu allowing for customization of more than 20 parameters to help you manage your soldering processes. 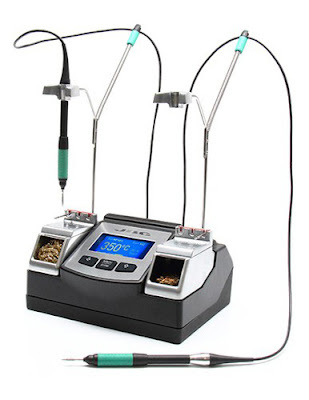 The JBC NANT Nano Soldering Stations and C105 Cartridges are available now at QSource.com. For other JBC Tools products please visit their respective pages. You can also give us a call at 800-966-6020 or contact us via email to place an order or get more info. If there's a product or topic you'd like to see The Q Source Resource write about please let us know. We'd also appreciate if you share this blog post with your friends and colleagues via the social media links below. If you have questions or comments about JBC Soldering Stations or related topics please leave us a message in the comments section.